In another not so startling crash test assessment of India-made cars, Global NCAP, the safety watchdog has accorded a zero rating to some of the more famous four wheelers sold here. This includes Hyundai's entry-level offering, the Eon, which was quite a popular car when launched in 2012. The right-hand drive Hyundai Eon scored poorly on the driver's head, knee and chest crash protection. In the meanwhile, the front passenger side scored a decent rating on the head as well as right calf muscle protection. 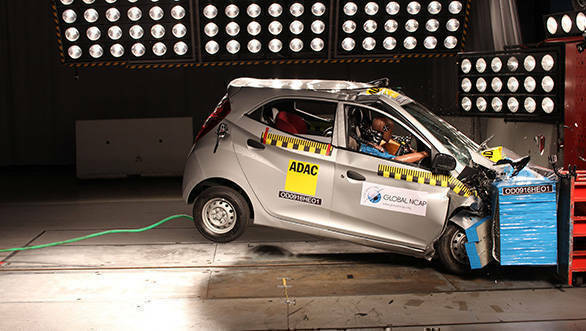 The Hyundai Eon was also deemed as structurally unstable by the Global NCAP. All the crash tests happened at 64kmph, the norm for Global NCAP. Hyundai sells the Eon in India with a driver airbag as an option on the top variant. The Eon in this test was a base unit which doesn't come with either ABS or airbags. Poor adult occupant protection was down to the lack of airbags.